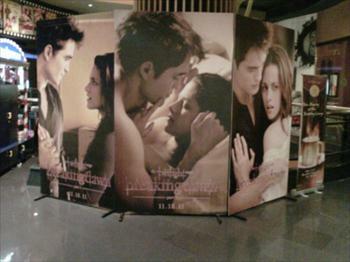 Photos of huge "Twilight Saga: Breaking Dawn" have been posted online. 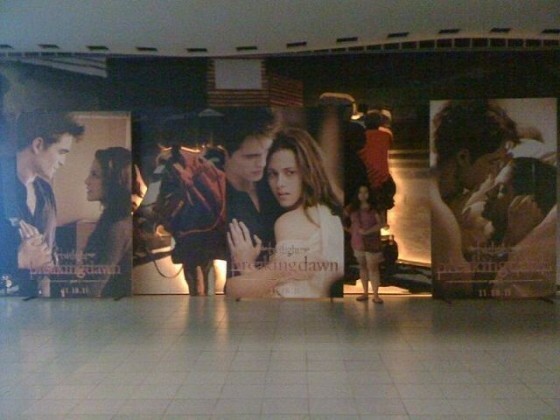 The images were snapped in a movie theater in the Philippines. Breakingdawnmovie.org posted images of the huge posters featuring Kristen Stewart (Bella Swan) and Robert Pattinson (Edward Cullen) cuddling up together. Also Comic-Con in San Diego, California, has announced that they'll be showing some exclusive footage from the movie at the event (July 20 - 24). This is going to be huge but unfortunately tickets sold out in less than three hours.